Aries, are worried that you haven’t washed and hanged curtains yet (or whatever household task bothers you)? You should than be aware of the fact that October may be the source of much more important questions than it obviously seem now. People born in Aries will have to cope with sharp criticism. The October horoscope predicts that your excellent results in 2018 are considered for granted; and therefore everything else (being only good or average) is making other people dissatisfied . Day by day and week by week, Aries will gain self-confidence and train the ability to find inner sources of energy. "Man is the measure of all things," said Greek philosopher Protagoras. But in October, only Taurus will be the right measure! Yes, nothing resists your X-ray vision. Do the kids wear odd socks? Woe to them! Does your darling have a messy table? He will definitely regret it. And what about you? If you find out that your figure is not suitable for the front page of Elle, when accidentally looking into the mirror, you will be properly angry on yourself. The October Horoscope is a colourful bouquet of excitement, impressions and strong emotional feelings for all Gemini people. This month of 2018 wants to tell you (metaphorically), that if you like strong coffee, imagine that you will drink it for a whole month; but twice as often as you are used to. According to the horoscope, October may be enjoyed above all by fearless people born in Gemini, who seek truly exciting experiences. Well, let's have it! However, a bold raft in the river full of piranha may only be the humble beginning. Cancer, October will definitely surprise you. Instead of feeling like lost in an empty desert, expect (literally) the power of the right hook from Muhammad Ali. But do not worry, ringing in your ears is not a sign of the final “knock out” accompanied by a towel thrown into the ring. You deserve the pleasure of heavenly jingle bells and pure angelic wings. The horoscope suggests that Cancer should not be modest in October. In everyday life, as well as in a restaurant, do not just enjoy the main course, but definitely require soup and dessert – be demanding and in everything life has to offer. Leo, an extended warranty can usually be purchased with any consumer electronics. But in love there is no such thing. The 2018 October Horoscope will surely convince you. Human relations are fragile and therefore it is not wise to treat them carelessly. Even Pattex or any other "miraculous" glue does not bring together marriage or relationship that falls from a 2 meter height on hard concrete floor. Leo, be correct, and show that you expect decent and fair behaviour from others as well. Virgo according to the October horoscope everything may seem to be a little "sluggish" now, whether you want it or not. Virgo’s bodily as well as mental harmony won’t start easily. But do not let your mood get spoiled by such unexpected direction of the tenth month. In marriage and in any other relationship, you have to simply accept that walking on the spot is just part of the training and a necessary preparation for next step forward. The Horoscope for the tenth month of 2018 shows you, who are born in Libra, as a powerful sailor crossing a mysterious river. However, while Charon, according to Greek mythology, was the ferryman of Hades who carried souls across the river Styx, Libra people are heading exactly in the opposite direction with their strictly optimistic boat. According to the October horoscope, Libra will shake head on how many people around are completely foolish about the correct estimate of the ability to plan and solve problems. But, according to the October horoscope, it is just Libra who will become a welcomed friend and colleague that will help others to drop the excessive burden and take them to the right side of the river of destiny. If Scorpio has to choose between warm slippers or solid farm boots that are suited for tough conditions, he or she should definitely prefer the second option. October is the month when Scorpio will give a goodbye to the easy comfortable life. "Whoever catches more hares at the same time does not catch even the single one," says the old proverb. It does not matter whether Scorpio will take a shooting bow, a ruler, a screwdriver, a brush, or a computer mouse, he or she will know exactly what to do and where to succeed. In October, Scorpio will not lack the necessary energy and proper orientation (ability of the sixth sense). Be alert, clear sky will be followed by clouds on the horizon. Thus, Scorpio should show more respect to common rules and order. Even checking your insurance or safety features of your car is not a bad idea in such situation. The horoscope is warning that chaos and distracting tendency may overtake the leading role in life of Scorpio. It will become evident mostly in the sphere of work organization, rather than in love and relationships. 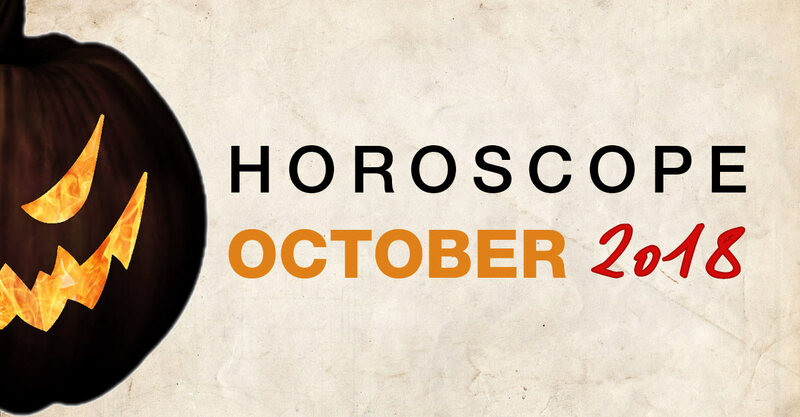 October 2018 should therefore encourage Scorpio to be more cautious and not to gamble with health, property, or money. Capricorn should remember that everything in your life may change by 180 degrees in a second, when someone in a fast moving car does not pay enough attention, or during a moment when you accidentally discover an old letter that should be forgotten forever – when you reveal an unpleasant secret. But the horoscope does not want to scare you. October 2018, however, will only stimulate Capricorn to deeper humility; enjoy the notion of all you have now, instead of lamenting what you ever had or could have. Big changes are in sight. Aquarius, horoscope asks: "Do you know what is the difference between butter and toothpaste?" Both are often white. But the main difference is that butter is completely natural (it only takes a long time to shake the milk); but you will not find the toothpaste anywhere in the wild. It is synthetic, therefore, made by man. And the October horoscope sees the greatest advantage of Aquarius in being able to synthesize – link things or people to new better and more useful units. You don't need to make any invention in chemistry, of course, it is enough if you put together a team of capable people or reconcile family or neighbours who have been arguing for years. The enlightenment often comes suddenly, like a flash from a clear sky. You can bite your lips, or the immense heat burns some of your nice curls, but it is certain that your life will not be the same as before. Pisces, according to the October horoscope, it is very likely that exactly this month (from the whole 2018) you will get a special insight into all important and complicated matters. You can feel like watching a theatre where comedies and tragedies alternate within the single performance. But that is life and it is necessary to accept it.